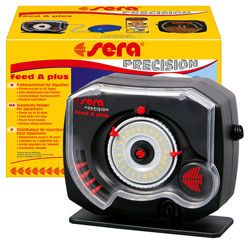 The sera feed A plus automatic feeder is convincing due to its easy operation and practical accessories. The round food drum holds approx. 80 ml (2.7 oz. ), the selected food amount glides out slowly and evenly into the aquarium. Therefore, there is no clumping caused by splash water. The gears resist accidentally turning in the wrong direction without any problems. Further new features include an easily removable splash water protection cover for optimally covering the operational elements and a special air hose connector. When connected to the latter one, the sera air 110 plus air pump will keep the food permanently dry. Up to 6 automatic feedings per day are possible.